A joint publication of the PCMA and the National Coucil for Culture, Arts and Letters of the State of Kuwait. Hundreds of stone structures, mainly circular burial mounds made of rough local stone, are found scattered in the coastal region of Al-Subiyah, a desert plateau extending along the north coast of Kuwait Bay. Since 2007 the Kuwaiti–Polish Archaeological Mission (KPAM), a joint project of the Polish Centre of Mediterranean Archaeology, University of Warsaw and National Council for Culture, Arts and Letters of the state of Kuwait, has been working in the region, carrying out among others an extensive survey and selected excavation of these stone structures. 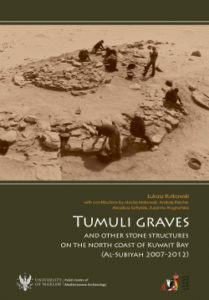 The “Tumulus Project”, which started as a small salvage excavation of a cluster of burial mounds in 2007, building on archaeological work in the region by Kuwaiti and Gulf Cooperation Council (GCC) teams since the turn of the 21st century, was expanded in the course of successive seasons to include a belt of land approximately 20-kilometers long running parallel to the shoreline. More than two hundred archaeological sites/structures, including around 130 tumuli and around 100 stone features of different type, were recorded. A select 40 stone structures were excavated, this counting 27 tumuli, seven of the mysterious “elongated structures” and six structures of a different kind. The archaeological evidence suggests that most of the tumuli were constructed during the Bronze Age. The present volume discusses the results of six seasons of investigations, from 2007 to 2012.